Festival of Kite Flying in Jammu on Raksha Bandhan and Shri Krishna Janmashthami - explore now. Kite (Patang or Guddi) is a light frame of bamboo stick covered with paper, often provided with a balancing tail, and designed to be flown in the air at the end of a long glass coated thread (Manja or Dor); it is held aloft by the wind. Making a kite is an art and flying it is a fine art. Kite-makers inherited and learnt the art of making kites from their ancestors passed it on to their future generations. A view of Kites on display in Jammu. In Jammu, kite flying is an important part of celebrations on Raksha Bandhan and Shri Krishna Janmashthami. The kite is called Guddi and the string with which it is flown is called 'Dor' by the locals. 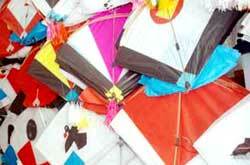 The kites are given different names depending upon the color combination and design. Names like Danda (stick), Pari (fairy), Chand Tara (moon & star), Chhapan Chhuri, Tiranga (tricolor), Budda (old man) are common. Highly maneuverable single-string paper and bamboo kites are flown from the rooftops while using line friction in an attempt to cut each other's kite lines, either by letting the line loose at high speed or by pulling the line in a fast and repeated manner. It is called Patang Baazi in Hindi. An array of designer kites soar the skyline in Jammu on Raksha Bandhan and Shri Krishna Janmashthami. People start flying kites early in the morning and continue until the evening. From dawn to dusk, people of all ages fly kites rejoicing in the spirit of the day. The blue sky is enlivened by colourful and pictorial kites. An array of colourful designer kites soar the skyline, their lines moving as if alive. Playing music while kite-flying is a common sight in Jammu. Music is loud and people dance when they cut someone other's kite. Crowded rooftops, fun-loving rivalry to outdo each other, and delicious feast are the hall-marks of the festival. Kite flying or Patang Baazi is a cultural sport in India as well. It is a fun sport for all times. Some say the history of Kites dates back to the days of Mahabharat. Kites were not only used in receiving messages but also measuring distances in war times. Kite flying has contributed to the composite culture and harmony of India. Related Topics - Raksha Bandhan Festival in Jammu. 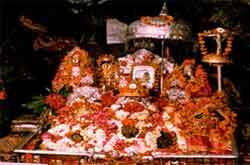 Shri Krishna Janmashthami in Jammu.